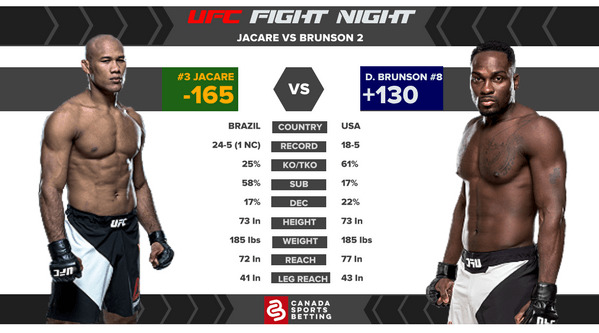 When Jacare (-165) and Brunson (+130) met in Strikeforce over five years ago, both fighters were primarily grapplers. Jacare was a championship-level Brazilian Jiu-Jitsu fighter while Brunson was a Division II wrestler. Nobody expected Jacare to dust Brunson within a minute. Brunson got reckless and charged at Jacare and got put down for his efforts. This was when Jacare's hot streak started. Following his KO win over Brunson, Jacare would win eight of his next nine bouts with his only loss being a split decision against Yoel Romero (who subsequently got busted for banned substances). Brunson has been on a tear himself finishing seven of his eight UFC victories within a round. With Jacare coming off his first stoppage loss in the UFC and Brunson on a two-fight winning streak, the two meet at pivotal parts of their career with a title shot potentially hanging in the balance. Currently, odds have this fight not ending in a decision (-505) and most pundits would agree that the pace and proficiency both Jacare and Brunson fight at almost ensures someone will be unconscious or submitting. A big part of this is due to Brunson's reckless abandon. Even under Greg Jackson's tutelage, Brunson has developed a "do or die" habit. He either finishes or he gets finished. The only decision loss in Brunson's UFC career came against Anderson Silva in a fight that saw Brunson outstrike Silva. His tentativeness swayed the judges away from him and it's a lesson he took to heart as he was quickly back to knocking out fighters within a round including former light heavyweight champion Lyoto Machida. Jacare, on the other hand, hasn't fought since he was knocked out by the reigning middleweight champion Robert Whittaker back in April of last year. Whittaker also knocked Brunson out a few events earlier. It is left to be seen how the loss changes Jacare's striking style. He is arguably the division's best grappler and he may elect to use this as opposed to striking with Brunson. Brunson, however, has a strong wrestling background and has a 100% takedown defence. Not even Yoel Romero was able to take him down in four attempts. This fight is more than likely going to stay on its feet. With either Jacare or Brunson getting knocked out in devastating fashion. Prediction: Brunson won't be as reckless as the first bout and Jacare will be more tentative following his knockout loss. The fight will start slowly with both being tentative. However, the moment leather starts flying, expect someone to go down and get finished. Jacare, while not as explosive as Brunson, is more precise and will catch Brunson and put him away. All betting odds via Sports Interaction. Lock it Up! For Gregor Gillespie (-580) versus Jordan Rinaldi (+380). While it's unadvisable to put that much on him at these odds, Gillespie is in a favourable matchup against a fellow grappler. Not only is Gillespie the better athlete but he is also faster and has a better chin. He wins this fight easily. Who's A Good Dog? If he makes it to the cage, bank on Erik Koch (+135) to turn the tables on Bobby Green (-175). Koch has been injured often but has a more versatile skill set than Green and is the better athlete. Assuming he is 100% for this fight, he should be the likelier winner despite the odds. Just Say No: to any of the three women's MMA fights. The favourites are not proven enough and the underdogs are not big enough. This is best to just watch as a fan. Randa Markos is the first Canadian to fight in 2018. Her local fans will be turning to Canadian-friendly sportsbooks, which aren't limited to UFC, when they decide to put a little wager on her.